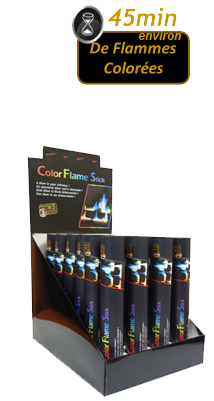 We have been creating and developing products related to fire for 15 years. The aim of SECURIFLAME is to offer innovative products to make the use of your fire place and BBQ as safe and enjoyable as possible.The SECURIFLAME professional ethic is to respect elementary rules such as innovation, quality, security and assistance. 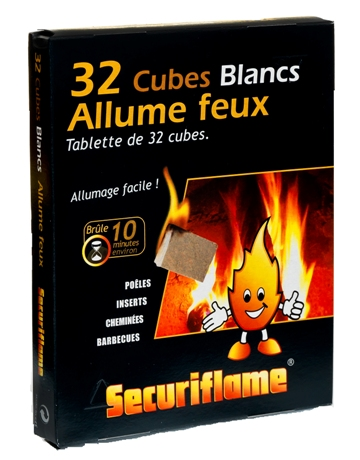 SECURIFLAME has a complete range of 35 references divided into 4 categories : security/maintenance, fire/lighting, maintenance/ renovation and pleasure. 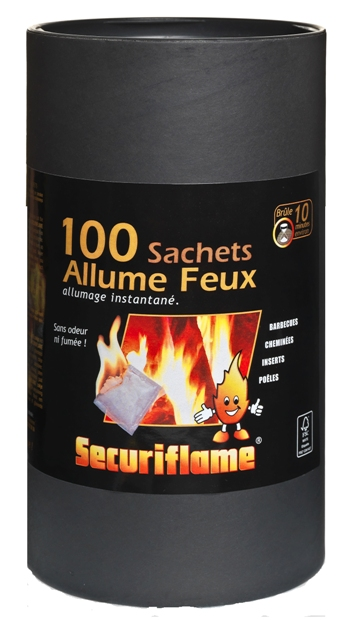 SECURIFLAME makes a drastic selection of its products, according to strict criteria to bring to its customers the best quality/price ratio. Permanently tested, our products are regularly upgraded to guarantee an optimal quality to the consumer taking into account the last chemical and technical evolutions that can bring to be patented products. 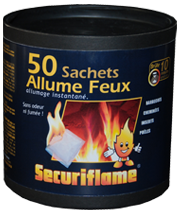 SECURIFLAME products are sold in 27 countries, in Europe, USA, Canada, and south America. They are available in food chains, do it yourself stores and garden centers. Everybody likes an open fire but it calls for a few minor points of attention every day. Whether to facilitate kindling, to guarantee a beautiful warm fire or a perfectly well-maintained hearth, SECURIFLAME has the answer to your requirements. The main source of difficulties is the fouling of the flues. As it burns, wood gives off tars, resins and soot. These are transformed into an inflammable deposit called scale which resists the traditional wire brush, the scraper, and even the chisel! In most cases, this results in the obstruction of the flues and people are often heard saying that a chimney "no longer draws"! Beware because these are the first signs of more extensive damage capable of causing a chimney fire. Today, there is no secret about it: to cut living expenses and enjoy greater comfort, the solution is a wood fire. The fist principle of wood heating is to assess the calorific balance of your home. The calculation most frequently done is based on an outside temperature of 0° for a house insulated to EDF standards. It is considered that it takes 50 W to heat one cubic meter; for instance, if the main room measures 60 m² with headroom of 2.5 m, the volume to be heated is 150 m³; the calorific requirement will thus be 7500 W or 7.5 kW. After carefully calculating all this data, what about the efficiency of your fireplace? Just check the manufacturer’s manual bearing in mind, for instance, that an insert with a heat recovery system offers a yield of between 10 and 15 kW. For a traditional fireplace with a cast iron backplate, the yield varies more but is at least 5 kW. For a warm winter, take out your calculator! First check that the fireplace walls are properly insulated and that there is no wooden furniture against any of them. Measure the distance between the smoke outlet flue and the nearest combustible element, leaving a minimum clearance of 16 cm. So you like the rustic look and visible beams? Remember the wood burns from a temperature of 150 ° while a strong fire exceeds 550°. Also check the proper insulation of the beams with regards to the fireplace. WOOD IS GOOD – IT'S ORGANIC ! Burning wood does not destroy the forests under any circumstances. In reality, it is quite the opposite. The increasing demands mean tighter management of the forestry inventory, keeping it and preserving it in the best of health. In France, forest domains are increasing and being renewed: let's take advantage of it. So using wood is good, but which wood? First of all, choose hard and dry wood. It burns longer. Do not hesitate to ask for and prefer oak, hornbeam, ash or beech which foul your chimneys less than resinous woods do. Above all, avoid silver birch which is easy to ignite but burns up like cigarette paper! The requirement to insulate chimney flues is something relatively new. Efforts made by heating equipment manufacturers to reduce energy consumption has led to reducing the gas emission temperatures. These lower temperatures in the flues can be a problem for installations which do not have satisfactory insulation to cope with the effects of cold from the outside. Too much tar and too much humidity in the flue. Low draft when a fire is lit. Possible backdraft of smoke into the house. The hot air in a house tends to rise and is less dense than the outside cold air. This tendency of hot air to rise generates a slightly greater air pressure than the neutral pressure in the upper parts of the house and a slightly lower pressure in its lower parts. The lower parts of the house may be affected by a lack of ventilation, especially when the heating installation routes the flues outside the house (flue attached to outside wall). Outdoor flues draw in less air. An operating chimney is a column of hot air surrounded by cold air. Hot gas turbulences naturally draw the air upwards. In winter, your house is a column of hot air in itself. The hot air contained in the house also creates a "draft" of air causing overpressure in its upper parts. Likewise, the pressure of the air in the bottom part of the house decreases, bringing less air to your heating apparatus. That is why, when the house is not properly insulated, the cold outside air enters more easily. This difference in air pressure inside the house is called the depression effect. This depression effect competes with your fireplace or stove if it is installed in the lower part of your house. A properly insulated installation with a flue inside the house, and not attached to the outside wall, will counter the negative pressure generated by the house. On the other hand, if the fireplace is not properly insulated or is badly placed or sized, it will be unable to counter the depression effect of the house and favor the blowback of smoke into it. Installing a fireplace on the main floor. Purchasing a modern and properly insulated fireplace. Installing the chimney flue inside the house. When the wind blows against your house, it produces positive air pressure on the side of the house against which it blows. It also produces negative air pressure on the leeward side of the house. This air pressure effect obviously depends on the orientation of your house, its shape, and any defective insulation in the lower parts. Wind causes an air depression to form in the house. If there are any sealing leaks on the leeward side, the wind can create sufficiently strong depression to cause the blowback of smoke into the house. The problem can often be solved by opening a window on the windward side. Opening a window on the side protected from the wind will worsen the phenomenon. The importance of CMVs and ventilation apparatus: Most houses have one or several air extractors. These include the extractor over the oven, ventilation of the bathroom or toilets, etc. Bathroom ventilation: 10 to 20 m3 hour. Kitchen extractor: 25 to 60 m3 hour. When an extractor is operating at top speed, the tightness of the doors inside the house may be insufficient. If there is a smoke blowback, reduce the draft of the air extractors. The house as a system. All the properties of your house and all the outside influences referred to below can have an effect on the correct draft of your fireplace. The challenge is to recognize all these influences and know how to decrease their negative effects on your fireplace or stove. The concept of "The House as a System" is a good way of seeing the house as a complete system made up of many components. Obviously, a fireplace or stove is a dynamic system coming under the influence of the house itself. Air returns into the house produce harmful air. They must always be considered as the failure of the ventilation system or a lack of insulation in the house. Always use dry wood or cut green wood finely and mix it with dry wood. Installing a high quality hat at the top of the chimney flue usually solves problems of backdrafts due to the wind. A lack of air pressure in the room can be solved by opening a window on the side exposed to the wind. Make sure that your ventilation apparatus (CMV, kitchen extractor etc.…) is turned off. Your chimney flue is too small or too big. The house is too tightly sealed and not enough air is getting into your fireplace. Basic notions: What happens when wood burns? Water evaporation: water can represent up to 50% of the weight of a green wood log. When the wood is absolutely dry, this percentage drops to 20% During the combustion of the wood, the water boils and consumes thermal energy. The damper the wood the more thermal energy it consumes to the detriment of the heat restored to the room. Smoke emission: as soon as wood heats and exceeds the boiling point of water, it begins to produce smoke. The smoke is the visible result of the decompression of solid wood into a cloud of combustible gas containing fine droplets of tar. If the temperature is high enough, and in the presence of oxygen, this smoke ignites. When the smoke burns, it produces the attractive flames that are so typical of burning wood. If the smoke does not burn, it rises through the flue in which it condenses to form tar and soot. Unburned smoke represents a large share of the wood energy. The coal phase: while the fire is burning and most of the gases and tars have vaporized, coal remains. 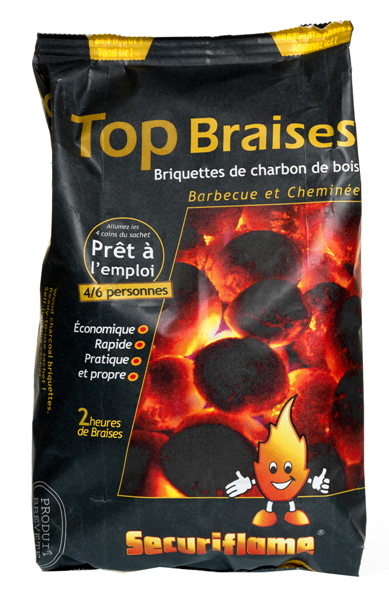 It is made up of almost 100% carbon and can burn in live red embers with very little smoke. Coal is an effective fuel burning easily and cleanly when oxygen is present. 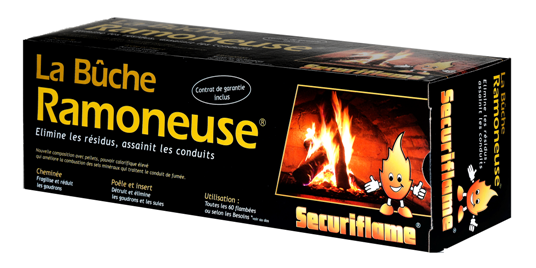 The SECURIFLAME Chimney-Sweeping Log is designed to resolve problems resulting from the maintenance of your fireplace. However, since every fireplace is different, and to optimize the effect of the SECURIFLAME Chimney-Sweeping Log, please read the following with care. By buying a SECURIFLAME Chimney-Sweeping Log, you have taken steps to considerably reduce the risk of a chimney fire, which is potentially serious. Every time you burn wood, tar forms and in the course of time builds up on the walls of your chimney. Tar is a highly inflammable component which can cause chimney fires. 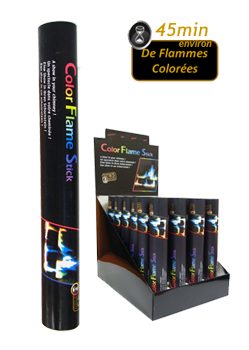 The SECURIFLAME Chimney-Sweeping Log contains a mixture of minerals which are dispersed during the combustion of the product. These minerals stick to the tar. This initiates a catalytic action for 15 days, rendering the tar particularly fragile. When you use your fireplace, the heat from the fire causes the tar to break free of the chimney walls and fall into the fireplace, as small particles. Laboratory testing has proved that burning a single SECURIFLAME Chimney-Sweeping Log can reduce fouling by more than 60%! The fact that the remaining deposits are far less inflammable is also particularly important. For you to use this product as efficiently as possible, we have listed below a number of frequently asked questions with the answers which we hope will supply you with the information you need. Thank you for making this purchase and we hope you will continue to use the SECURIFLAME Chimney-Sweeping Log for the regular maintenance of your chimney. 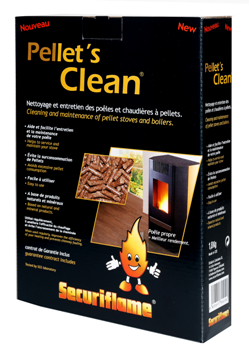 Does the SECURIFLAME Chimney-Sweeping Log replace the mechanical cleaning of your chimney? How many times does my chimney need to be examined? Is the SECURIFLAME Chimney-Sweeping Log as efficient as a wire brush? 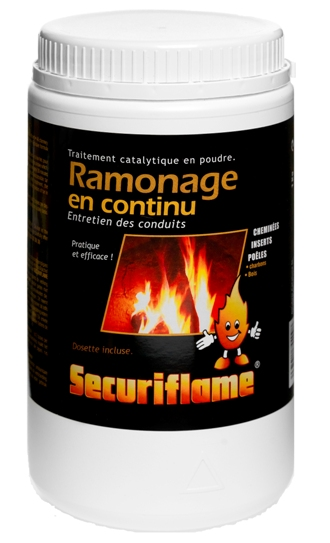 Will the results be immediately visible if I use the SECURIFLAME Chimney-Sweeping Log ? Can I set a fire just after using the SECURIFLAME Chimney-Sweeping Log ? Is the SECURIFLAME Chimney-Sweeping Log safe in a wood stove or a closed fireplace? I have noticed that that the SECURIFLAME Chimney-Sweeping Log produces smoke for a few hours after the flames have gone out. 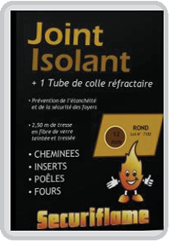 Can the SECURIFLAME Chimney-Sweeping Log be used in a boiler burning oil and wood? 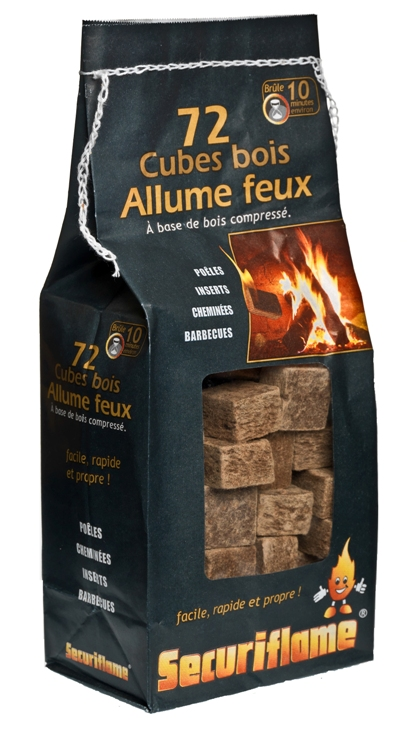 Can the SECURIFLAME Chimney-Sweeping Log be used in a pellet energy stove? Can the SECURIFLAME Chimney-Sweeping Log be used in a "zero clearance" fireplace? Can the SECURIFLAME Chimney-Sweeping Log be used in a catalytic converter stove? If I burn two Chimney-Sweeping Logs, will I get better results? I have noticed that smoke is released into the room after the SECURIFLAME Chimney-Sweeping Log has stopped burning. Why is this? Does the SECURIFLAME Chimney-Sweeping Log heat more than a wood log or a reconstituted ? My SECURIFLAME Chimney-Sweeping Log did not ignite when I lit the paper. Why is this? Can I use my SECURIFLAME Chimney-Sweeping Log with my gas or propane fireplace? When I inspected my chimney 2 weeks after using the SECURIFLAME Chimney-Sweeping Log, I could still see black soot. Does it mean that the log did not work? TIP: For the maximum efficiency of your SECURIFLAME Chimney-Sweeping Log, we recommend you put it on the embers of the back of the fireplace. 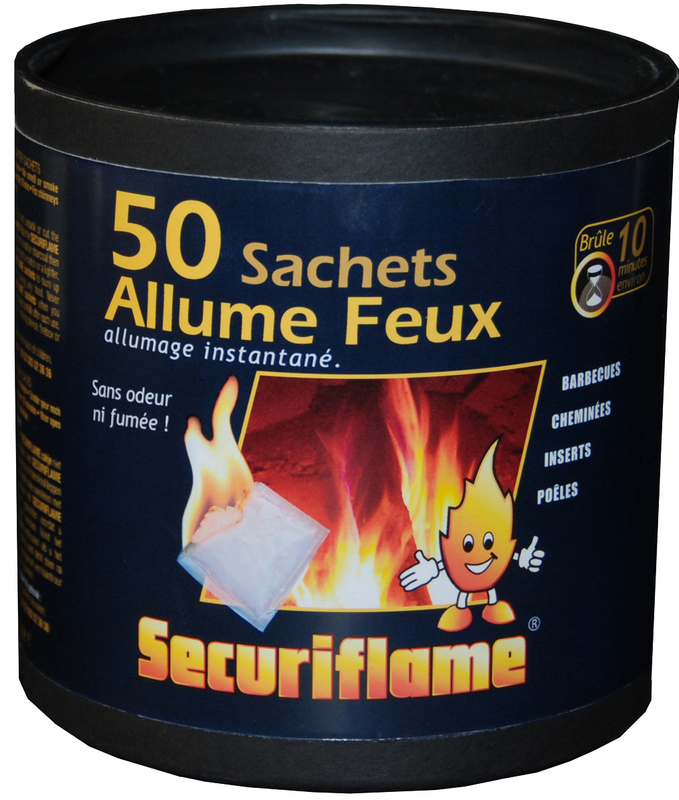 The SECURIFLAME Chimney-Sweeping Log is not corrosive and when used regularly, will help keep your chimney cleaner. The SECURIFLAME Chimney-Sweeping Log delays the buildup of creosote and reacts with most deposits in chimneys, to reduce their adherence. There is less risk of a chimney fire when deposits and creosote have been eliminated. 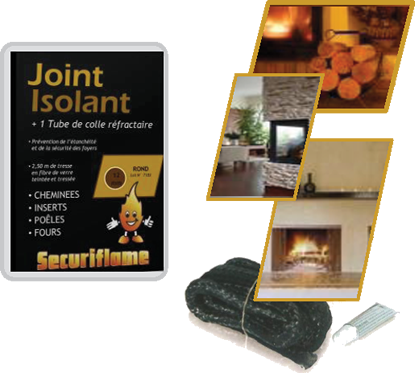 The SECURIFLAME Chimney-Sweeping Log can be used in all open fireplaces and inserts, and in wood stoves and boilers. If you use your chimney frequently, we advise you to burn a SECURIFLAME Chimney-Sweeping Log at the beginning and end of each winter, for optimal results. For bent flues, and after treatment with the SECURIFLAME Chimney-Sweeping Log, creosote can fall and block the flue. Inspect the flue thoroughly to be sure that there is nothing obstructing it. Q2) Does the SECURIFLAME Chimney-Sweeping Log replace the mechanical cleaning of your chimney? A) No. The SECURIFLAME Chimney-Sweeping Log will not indicate whether your chimney is obstructed or damaged. It should be examined regularly by a professional to determine its state. Q3) How many times does my chimney need to be examined? A) It depends on the age and condition of your chimney. In any case, you should always examine the chimney to check it is clear at the beginning of each season, making sure that there are no debris or birds’ nests preventing suitable airflow, which is necessary for an effective draft. Q4) Is the SECURIFLAME Chimney-Sweeping Log as efficient as a wire brush? A) If you are planning to use mechanical cleaning, we really encourage you to burn a SECURIFLAME Chimney-Sweeping Log approximately 15 days previously, as it will considerably improve the cleaning action, by rendering the tar more fragile and causing it to come away more easily. 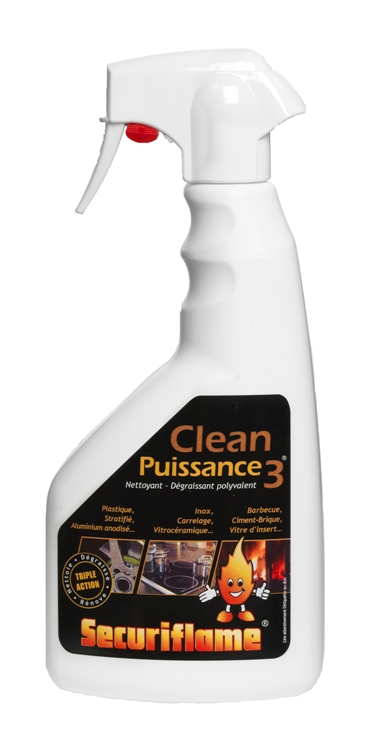 Q5) Will the results be immediately visible if I use the SECURIFLAME Chimney-Sweeping Log? A) No. The catalytic action lasts approximately 15 days. While you continue to use your fireplace, you will not notice the particles of tar which fall and mix with the ashes. 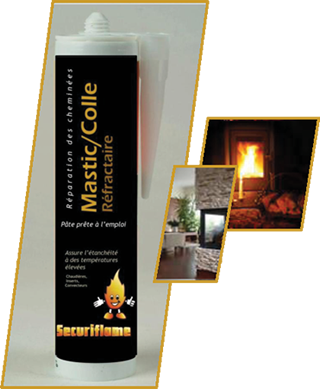 The heat of the fire will ensure that the SECURIFLAME Chimney-Sweeping Log continues to fight against the action of dangerous deposits building up in your chimney and reduce their inflammability. Q6) Can I set a fire just after using the SECURIFLAME Chimney-Sweeping Log? A) Yes. However, avoid fires with tall flames for the following 15 days. Q7) Is the SECURIFLAME Chimney-Sweeping Log safe in a wood stove or a closed fireplace? A) Yes! Simply make sure that you burn it on its own and that there is a strong draft. You must make sure that the dampers are wide open until the SECURIFLAME Chimney-Sweeping Log has burned entirely and is no longer smoking. Q8) I have noticed that the SECURIFLAME Chimney-Sweeping Log produces smoke for a few hours after the flames have gone out. A) Yes! This is part of the process enabling the minerals to rise towards the top of the chimney and deposit themselves on the tar. Q9) Can the SECURIFLAME Chimney-Sweeping Log be used in a boiler burning oil and wood? A) Yes! But make sure that you have first turned off the oil heating system or the treatment will not be as effective. Also make sure that you put the SECURIFLAME Chimney-Sweeping Log in the wood burner compartment (you can cut the log into smaller pieces if you need to). Q10) Can the SECURIFLAME Chimney-Sweeping Log be used in a pellet energy stove? A) No, for this type of stove use the Pellet’s Clean SECURIFLAME. Q11) Can the SECURIFLAME Chimney-Sweeping Log be used in a "zero clearance" fireplace? A) Yes! Simply follow the safety recommendations and instructions for use. Q12) Can the SECURIFLAME Chimney-Sweeping Log be used in a catalytic converter stove? A) Yes! Simply follow the safety recommendations and instructions for use. 1. 1. Set a normal wood fire in your stove and wait for it to reach the ideal operating temperature so that the catalytic converter operates. 2. 2. Put the SECURIFLAME Chimney-Sweeping Log on the remaining embers (make sure there are no flames) and leave the door ajar to allow the greatest possible inflow of cool air. Q13) If I burn two Chimney-Sweeping Logs, will I get better results? A) If you have a large fireplace or an excessive accumulation of tar (6 mm or more), greater efficiency will be obtained by burning two Logs at a distance of approximately 30 cm. For standard fireplaces (80 x 80 cm), one SECURIFLAME Chimney-Sweeping Log is enough. However, if you burn a second log 10-15 days later, the remaining deposits will be further reduced. Q14) I have noticed that smoke is released into the room after the SECURIFLAME Chimney-Sweeping Log has stopped burning. Why is this? A) Although this does not happen often, it may occur if your fireplace cools too quickly after the flames have gone out, causing a back draft blowing air down the chimney. This can happen with any type of fire. If it does happen, we suggest that you put newspaper in the hearth and light it carefully so that the heat restarts the circulation of air towards the top of the chimney. To avoid this problem, we advise you to burn the SECURIFLAME Chimney-Sweeping Log on hot embers, after a normal fire. Q15) Does the SECURIFLAME Chimney-Sweeping Log heat more than a wood log or a reconstituted ? A) The heat from a SECURIFLAME Chimney-Sweeping Log will be more or less identical to that of a normal log. Q16) My SECURIFLAME Chimney-Sweeping Log did not ignite when I lit the paper. Why is this? A) A shortage of air may sometimes make lighting difficult. If this happens, you can use newspapers underneath to start or to rekindle the lighting process. Q17) Can I use my SECURIFLAME Chimney-Sweeping Log with my gas or propane fireplace? A) No! There is no need to use the SECURIFLAME Chimney-Sweeping Log in such cases, which could be dangerous. Q18) When I checked my chimney 2 weeks after using the SECURIFLAME Chimney-Sweeping Log, I could still see black soot. Does it mean that the log did not work properly? A) Yes, it has worked. 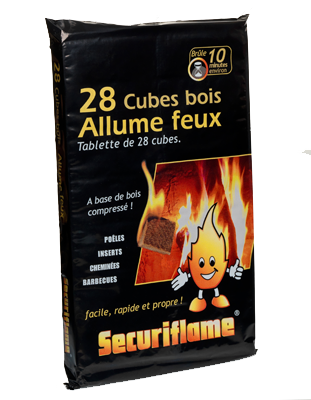 But the SECURIFLAME Chimney-Sweeping Log is designed to eliminate dangerous tar that causes chimney fires. It will not always remove soot dust that most often forms towards the top of the chimney. This requires mechanical cleaning that you can do when the flue is fouled to the extent that it is preventing the draft through your chimney. 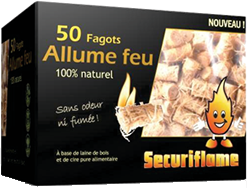 By using this SECURIFLAME Sweeping Log or Pellet's Clean product, you are entitled to a free personal guarantee. 1-If there is a chimney fire, the guarantee acts as a complement to the fire insurance contract that you have taken out elsewhere (home insurance policy). 2-Our guarantee covers the excess and/or any wear and tear for which you are responsible, after being indemnified by your fire insurance within the limit of 5.000 €. These guarantees are effective starting from the 16th day after the date of use of the product, confirmed by the postal franking date. The guarantee lasts for 1 year. By accepting the guarantee terms, you engage yourself to use the product according to the recommended conditions. It is easy to check wether the product has been used or not. If you have not used the product, the abovementioned guarantee and liability are considered void in the event of an incident. 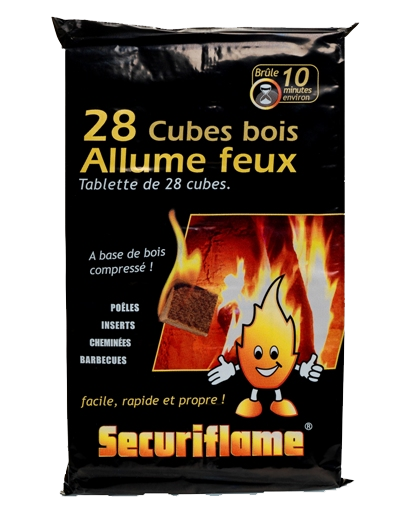 100 Sachets Allume feu Nettoyant Vitres Insert.